It's Gloria from Girlia's Cards sharing an Action Wobble card. This card allows me to get yet another CHRISTmas card crossed off my long list of Xmas cards. I just love watching these bells move and an Action Wobble makes that possible. I just love that song Silver Bells, so I decided to make some in honor of the CHRISTmas song. If I don't get an opportunity to say Merry CHRISTmas to you I would like to say it now...Merry CHRISTmas everyone!! 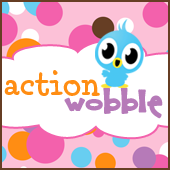 Don't forget to stop by the Royal Castle Shoppe and get your action wobbles today. Don't forget there is something new for you to see everyday so come back tomorrow to see what is on the Action Wobble Design Team blog for your inspiration. Enjoy and GOD Bless!! Pretty card, perfect embossing folder!